Select prints are now available for SALE! This prints out to an 8x24 inch canvas. I was lucky enough to witness this live in the high desert just south of Madras, Oregon. It was imaged with an 80ED Telescope and a Canon DSLR. This image is a combination of the Solar Eclipse of 2017 and Super Moon image of 2015 in order to show some texture to the eclipse. Large Canvas Print - 2015 Lunar Eclipse Collage - This is a collage from start to finish. The center image is the eclipse in full totality. 2015 Lunar Eclipse Collage - This is a collage of the 2015 Lunar Eclipse from start to finish. The center image is the eclipse in full totality. Super Moon November 2016. Its hard to get contrast when imaging a full moon. I used an over saturation technique to bring out the detail in the mares. From an imaging perspective, the Super Moon is no different... but this time, it barely fit in field of view at prime focus. Sun - Our nearest star imaged with a 60mm Coronado Solarmax telescope and a Celestron Skyris 274mono camera. SuperMoon - Third SuperMoon of 2014. This one is a Harvest Moon. Andromeda Galaxy - You can see the core of the Andromeda Galaxy, M31 with the unaided eye. In fact, this is the farthest thing that you can see with the naked eye. This is an exposure of about 4.5 hours with an SBIG astronomical camera - ST-8300c. This is an image of Jupiter found in the bottom right. Ganymede, Io, and Europa are the moons seen left to right. One evening while waiting for the night to begin, I was focus my equipment on the moon and I fired off this shot. You can almost see the outline of the rest of the moon. Back in 2012, there was a once in a life time even as Venus went in front of the Sun from the Earth's perspective. 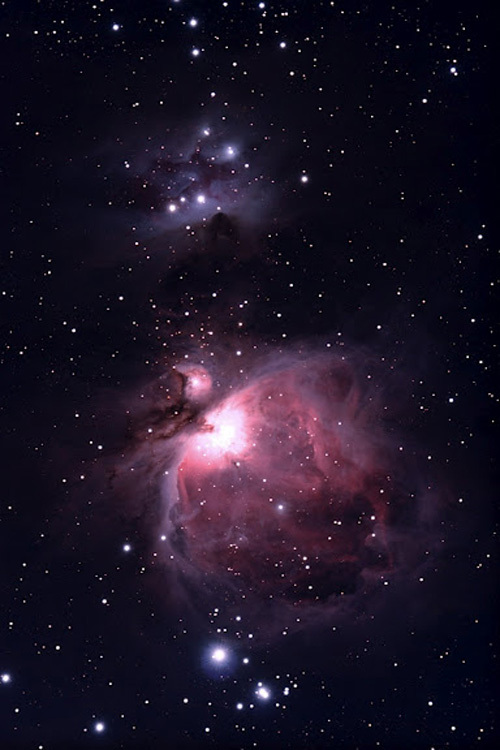 The Orion Nebula or Messier 42 is a virtual factory for stars. This nebula is a mere 1300 light years from earth. Hubble has actually imaged some of the primordial stars that are much like our own sun 4.5 billion years ago. Most night sky enthusiasts recognize the Orion Constellation, the Hunter. This is the same set of stars but photographed through a Hydrogen alpha filter. This filter helps single out the light wave where H emits. This way you can see the faint supernova remnant arc called Barnard's Loop to the Hunters right.